#957 at North Freedom, April 2000. Barney & Smith built #957 as a first-class coach. It was one of a series of 19 wooden coaches (numbered 957-975) delivered to the Soo Line in 1907. 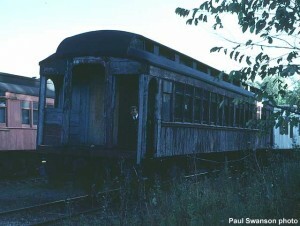 This series was one of the last orders for wooden coaches by the Soo Line. The car has full vestibules, seats 64 passengers, and weighs 77,500 pounds. #957 was furnished with plush seats, oak interior woodwork, and oil lamps. 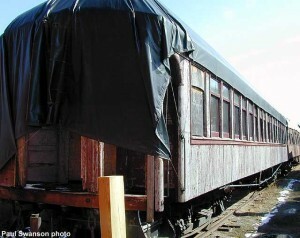 The coach remained in passenger service until it was rebuilt into a work car at the Shoreham Shops (Soo Line’s main shop facilities near Minneapolis, Minnesota) in November 1941. It was converted to a bunk and dining car and renumbered X-1425. The car was used by the engineering department until 1964, when it was acquired by Mid-Continent. #957 returned to passenger service in the late 1960s at the museum. Today it is stored, awaiting funds and time for a restoration. So Line #957 during switching at North Freedom, October 1992. Paul Swanson photo. Articles of Incorporation for the Minneapolis Sault Ste. Marie & Atlantic Railway (commonly known as Soo Line) were filed in Madison, Wisconsin on September 29, 1883, by several Minneapolis businessmen. Their goal was to link the flour mills of the Twin Cities with the Great Lakes shipping port of Sault Ste. Marie. By the end of 1887, the line was completed across the northern part of Wisconsin to reach the road’s namesake. The next 25 years saw much expansion and consolidation with other smaller roads. The Wisconsin Central was leased in 1909; in 1961, it was formally absorbed as well as the DSS&A to form the new Soo Line Railroad. Soo Line successfully purchased the remains of the Milwaukee Road in 1985, forever changing its system map; two years later, the new Wisconsin Central Ltd. purchased the old WC route and other track from Soo Line. Today the Soo Line exists only on paper, under the Canadian Pacific banner, most of its original trackage now operated by other companies or abandoned. Soo X-1425 (ex Soo #957), Waukesha, WI; Feb. 27, 1966; Ray Buhrmaster photo.